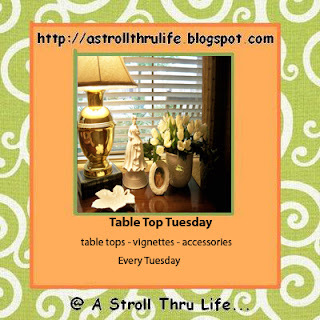 Thought I'd pop in to participate in Tabletop Tuesday over at A Stroll Thru Life. I would love to tell you that I have some fabulous projects to show you soon, but I have been busy doing some BOOOOOORING stuff....2 tax returns for each of my daughter's, accounting for 2010 rentals for my extended family, getting our tax stuff together for our accountant ... and then there's stuff such as planting seeds in the garden and cleaning up flower beds, trimming trees, etc., that really don't make for good blog posts or photos! My mother in law's husband passed away and Mr. F and the girls had to make another trip(they drove) to Chicago. I wasn't feeling well, so I passed on the long trip. My youngest daughter had to fly home so she could leave for Florida for her senior trip. My oldest daughter has an interview in Hollywood, California this Thursday and we've been making arrangements for that! Ok, so that's the short version of all that's been happening at Casa Fanatic. I've left a whole bunch of stuff out to save you from being totally bored! Found these apothecary jars at HomeGoods. The jars came with the decorations on them. Definitely icing on the cake! There will be another high school graduation party in another month at our house and these will look great filled with some colorful candy on the dessert table. Thanks for stopping by! Leave me a note and I'll stop by and see you too! Sorry that I haven't made the rounds lately! You have been a busy girl! Aren't you glad those taxes are done! Sounds like a lot of celebrations are going to be happening at your house. I love your new apothecary jars and your birdie is too cute! Hollywood! How exciting! You'll have to tell us more! Your tablescapes are very pretty. Hi Pam! Love your goodies. I saw those jars and had one in my hand and thought, oh dear what can I do with this. THey are so pretty. Love the birdie too. Happy taxing and planting to ya! Wow Pam! You've been busy! Good luck to your daughter with her interview and I'm sorry about your Mother-in-law's loss. I love the spring-y look of the bird and apothecary jars! Simple & elegant! Just a touch is all that's needed sometimes and you gave just the right touch Pam! You are busy busy. Love the bird and those jars are great. You are having some busy times Pam. Sort of like that around here and J is retired! I often wonder how we managed when he was still working. Anyhoo...your vignettes are beautiful and I know you are looking forward to "normal"
my it does sound like you are busy! Hi Pam! Poor poor busy one! I love your pretty Easter vignettes and your snaps are lovely. I'm also loving the silver tray display ... mostly because I have quite a few spare myself and you have given me some great ideas! Thanks! You have been busy! You still have found the time to design some lovely vignettes. They look great!